Special thanks to The Northam All Suite Hotel for extending this food review invitation. The Northam All Suite Hotel is a business hotel at Jalan Sultan Ahmad Shah. Since November 2016, the hotel has been given a new lease of life under a new management team. Operated by the same company as Macalister Mansion, The Northam will be revitalized in phases starting with the Roof Terrace on the Level 9. Today, The Northam gives a sneak peek of its upcoming Ramadan buffet promotion. 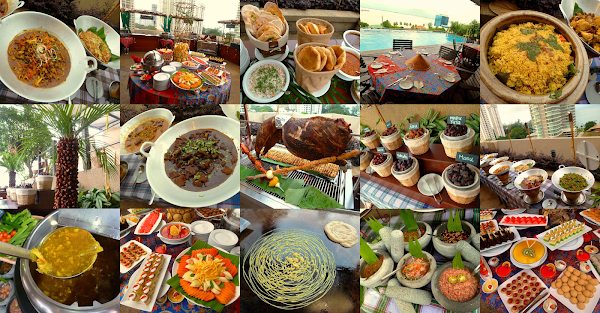 With "Selera Kampung" as the theme, the buffet focuses on traditional Malay cuisine with elements of local Penang hawker fare. Conceding the fact that the Roof Terrace offers limited space, the kitchen crew does not intend to offer too many dishes. Instead, the team prioritizes quality over quantity. Nearly a dozen cooked dishes are served in kuali (woks) as per tradition in rural Malay villages. Several nipa-thatched stalls are also erected to serve local Penang hawker food such as Asam Laksa and Pasembur. The poolside section can accommodate around 80 people in al fresco setting. Facing the Penang Strait to the east, the Roof Terrace takes advantage of cooling marine breeze while being sheltered from the glaring evening sun. In the event of rain, the Ramadan buffet will be moved to the Coffee House at the lobby. Larger dining parties can also use one of the function rooms on Level 3. As per tradition, Muslims typically break fast by consuming kurma (palm dates). The Northam prepares a variety of dates from several countries - mostly from the Middle East and North Africa. Examples of popular date cultivars are Wasem, Safia and Meera El Medina. As a form of attraction, dates are also used to decorate the "bark" of a pair of "palm trees". The dates are held in place by toothpicks, and have to be meticulously assembled piece by piece. Although the dates can be eaten, I suspect that most people prefer to go for the ones on the dishes. Ulam (raw vegetables) is another popular food among the Malay community, especially for those who live in rural areas. Types of vegetables provided are bendi (okra), kacang panjang (yardlong beans), kacang botol (winged beans) and cili hijau (green chili peppers). Raw vegetables are usually lacking in flavor, so they are customarily eaten with condiments such as cincalok (fermented shrimps), budu (fish sauce), air asam (tamarind sauce), sambal belacan (spicy shrimp paste) and sambal kicap (spicy soy sauce). Most of these condiments are traditionally prepared using mortar and pestle, but nowadays blenders are also used for convenience. Other iconic Malay dishes include Kerabu Mangga (Mango Salad), Kerabu Telur (Egg Salad), Kerabu Taugeh (Bean Sprout Salad) and Acar Timun (Pickled Cucumber). Ikan bilis (anchovies), ikan masin (salted fish) and kacang goreng (roasted peanuts) are also provided. Sup Kambing (Mutton Soup) and Mushroom Soup are served today. During actual Ramadan dinners, Bubur Lambuk is also included as this porridge is an essential iftar (breaking fast) appetizer. During Ramadan, mosques throughout the country usually cook Bubur Lambuk in large pots and distribute the porridge to the needy. Kambing Golek (Roast Lamb) is skewered on a rotisserie and roasted over burning charcoal, allowing the lamb to attain toasty aroma. Condiments to go with lamb are air asam, rosemary sauce and mint sauce. Other grilled meats are Ayam Panggang (Roasted Chicken), Satay Ayam (Chicken Satay), as well as chicken and beef version of Shish Kebab (şiş kebap). Roti Jala (Net Crêpe) uses batter made from flour, eggs and turmeric. The batter is drizzled onto the griddle using a special type of cup. Web-like pattern allows Roti Jala to attain lacy form as the batter solidifies. Roti Jala is then folded over twice, and served with chicken curry or beef curry. Also available are Roti Canai and Roti Boom. Dal tadka (lentil curry) is provided as dipping sauce. Speaking of flatbread, there are also less-familiar ones like the oven-baked Naan and the deep-fried Bhatoora (भटूरा). I think the flatbreads should be cut into smaller pieces as most people prefer to sample a variety of food in a buffet setting. As for condiment, raita (रायता) is made from yogurt and serves as dipping sauce. Rojak is a combination of bite-size pieces of mango, guava, sengkuang (jicama), cucumber, pineapple and papaya. The mixture is tossed with extremely thick belacan (shrimp paste). I enjoy every last drop of this addictive sauce. Meanwhile, Pasembur is a local snack from Penang. Served in spicy peanut sauce, Pasembur comprises of prawn fritters, hard-boiled eggs, boiled potatoes, bean curd, jicama, cucumber, fishcake and crab sticks. I think the Pasembur pales in comparison to Rojak. The broth of Asam Laksa is prepared from sardine instead of the usual mackerel. Honestly, I think sardine does not appeal to my palate as much as mackerel does. Typical Asam Laksa ingredients are thick rice noodle, pineapple, onion, cucumber, bunga kantan (ginger flower) and daun kesum (laksa mint). Some people also prefer to add a spoonful of belacan to enhance the flavor of fish broth. Nasi Briyani (Biryani Rice) uses long-grain basmati rice, which is lighter on the mouth when compared to jasmine rice. The rice is flavored with a variety of spices from the Indian subcontinent. Meat and ghee (clarified butter) are also used. I actually prefer the rice grains to be "looser" and not so clumped up. As for poultry, Ayam Percik (Roasted Spiced Chicken) is a popular delicacy from the east coast of Peninsular Malaysia. Daging Rendang (Spicy Beef) is originally a Minangkabau dish but has enjoyed widespread popularity in Malaysia. Cooked slowly in coconut milk and spices, the beef is gradually tenderized and infused with delectable flavors. The recipe has room for improvement in terms of beef tenderness. Meanwhile, tenggiri (mackerel) is the choice of fish for Ikan Masak Lemak (Fish Curry With Coconut Milk). Other dishes served in kuali are Sotong Goreng Kunyit (Stir-Fried Squid With Turmeric), Telur Goreng Bawang (Fried Eggs & Onions), Kacang Panjang Goreng (Stir-Fried Yardlong Beans) and Sambal Taukua (Dried Tofu In Spicy Sauce). Moving on to warm desserts, Bubur Pulut Hitam (Black Glutinous Rice Porridge) enjoys widespread popularity thanks to its soothing sweetness. This sweet treat is quite filling, so it is advisable to go for it towards the end of the meal. Meanwhile if you need something to quench your thirst, there are crowd favorite drinks like Bandung, Soya and Teh Tarik. The desserts table also features a reasonable variety of pastries such as cakes, tartlets, custards, mousses and fruit jellies. There are also a handful of Malay kuih such as Kuih Talam. In my opinion, I think the desserts section should present a greater proportion of Malay kuih especially in a Ramadan dinner setting. 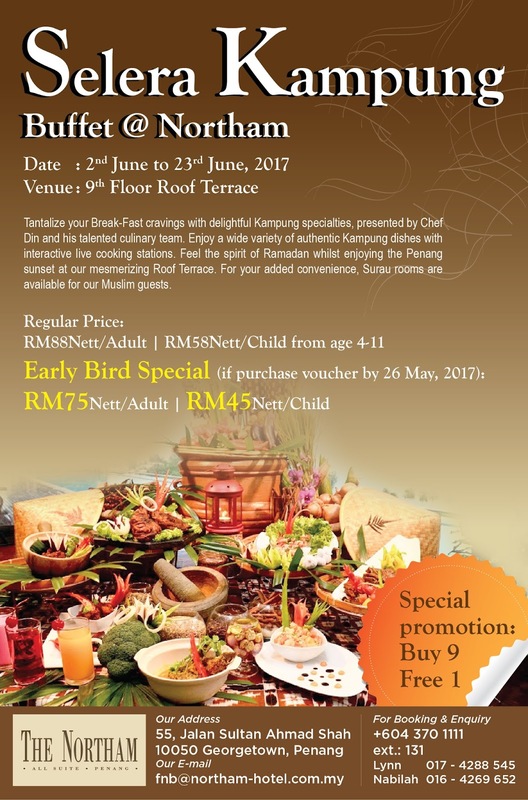 The Northam's Ramadan buffet dinner is held every evening from 2 to 23 June 2017. The regular prices for adults and children are RM88.00 and RM58.00 net respectively. Early bird vouchers are available at RM75.00 and RM45.00 respectively. The Northam also offers "buy 9 free 1" offer throughout the month-long event. This promotion also applies to guests who have bought early bird vouchers. That's twice the value for money! Directions: The Northam is located on Jalan Sultan Ahmad Shah, right after VOUK Hotel Suites. There is a multilevel parking garage in the hotel.